A recent convert to Gmail, RLConner asked the Answer Line forum about organizing mail into what Google calls "labels,' although they're similar to other services' folders. Gmail labels behave very much like folders in other digital environments. You can store messages and conversations in them to organize your mail. And they're hierarchical--you can put one label inside another. For instance, I keep an Answer Line label, and inside that I have labels for newly-arrived reader questions, questions I've put aside for possible use in the blog, and reader comments. Google doesn't called them folders because you can attach multiple labels to a single message. Imagine you're dealing with paper instead of electronic messages. You can put a sheet of paper into a folder, then pull it out and put it in another folder, but you can't keep it in both folders at the same time. Yet you can stick two or four or 18 labels onto that sheet of paper. Add the kind of search capabilities you don't get with paper, and you can see the advantages.. 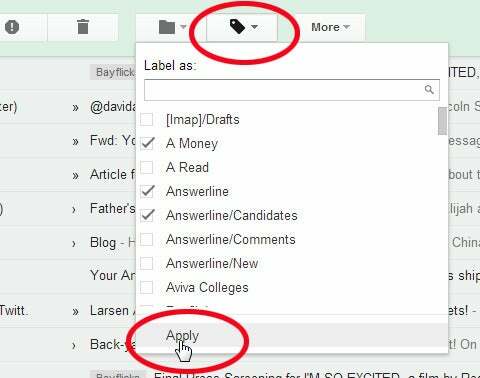 If you select or open a message, you'll see a label icon near the top of the Gmail window. To assign a label to a message, click that icon, select one or more labels from the pull-down, then click Apply at the bottom of the menu. You can also move a message to another label--which feels like pulling it out of one folder and putting it in another. That's why you move a message by clicking the folder icon to the immediate left of the label icon. You can also move a message by dragging it to a label in the left column. To create a new label, click either of the two icons discussed above, and select Create new. Click either of the discussed icons discussed above. The last item on the pull-down menu will be Manage labels. This brings you to a full-page label-editing environment. Point to a label in the left column, but don't click. A down arrow icon will appear to the right. Click it for a menu of editing options.